The Commercial Bank of Ceylon has been adjudged the Most Productive Network in South Asia in 2012 for MoneyGram, the global funds transfer company. 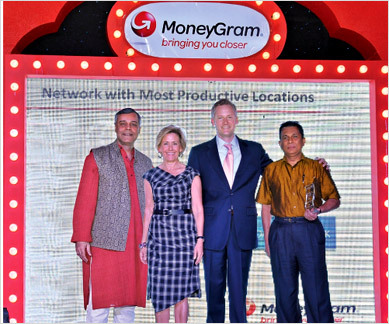 This is the second successive year that the Bank received this award, which was presented at MoneyGram's Regional Conference in Jodhpur, India. Commercial Bank is one of the preferred networks for MoneyGram beneficiaries because of its network of 231 branches and service points in Sri Lanka. Funds can be collected even on holidays, at over 50 holiday banking centres of the Bank. In order to ensure a speedy pay out, the Bank has set up dedicated counters at some of its key locations popular for remittances. Pictured here is Commercial Bank Assistant General Manager Operations Palitha Perera (extreme right) at the ceremony with MoneyGram Officials. RscBux is the Innovation in Paid-to-Click Services. most used and reliable paid-to-click service.